I am a proud descendant of the Wiradjuri Nation of Aboriginal people. My family lineage stems from the Central West region of NSW. The majority of my mother's siblings were born on Erambie Mission or better known by the locals as 32 Acres. That was the amount of land reserved for the community to live on. I am a mother of 4 children and grandmother to 8. 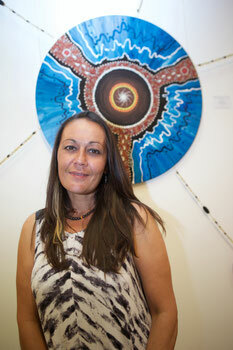 I have been a practitioner of Contemporary Aboriginal Art for 27 years. I work a full time job and often find myself using the creative arts to provide a program or service to the community, as an extension to my current work. The challenge of practicing art whilst working full time often comes to a halt. I find it difficult to source a point of inspiration these days. When the flow stops, I get in my car and drive until I find a spot that appeals to me, I carry a painting kit with me everywhere and when the opportunity arises I will get my kit out and paint.